The Digital Transformation Initiative of the World Economic Forum estimates that digitization across all industries could unlock $100 trillion of economic value over the next decade. Beyond the hype, the enthusiasm and the staggering potential, of course, there’s serious industry turmoil underway as companies across multiple industries face the existential threat of digital disruption. There’s no doubt that digital business is changing the nature of competition. Today, it’s not just traditional industry competitors you need to worry about, but new entrants from outside your industry, equipped with new digitally-based business models and value propositions. These digitally-based business models have the power to impact all five forces of industry competition in the classic Porter model, so traditional rules of competition no longer apply. What’s more, incremental efforts towards digital may do little to assist. According to McKinsey, only 8% of companies believe their business model will remain economically viable if their industry keeps digitizing at its current course and speed. Digital transformation has its benefits, but it also has its downside for those organizations who fail to keep up. Even among those organizations who are already well-along on their journeys for digital transformation, and who are working hard to avoid becoming a statistic, the odds of success are slim. The fact is that digital transformation efforts are significantly more challenging than others. According to Bain & Company, in a study of hundreds of companies executing major changes, they found that only 12% achieved or exceeded expectations with regard to traditional transformation initiatives and, worse still, only 5% achieved the same with regard to digital transformation. The barriers to achieving success are numerous. Some of the key issues relate to the broad scope and high complexity of digital transformation initiatives as well as its cross-functional nature which necessitates coordination and collaboration across the entire organization. Digital transformation is a company-wide “team sport” and requires both perennial capabilities – such as leadership, change management, governance and culture – as well as a new set of capabilities specific to not only digitally transforming the organization, but making it an ongoing competency. For success with digital transformation, it’s important to view it strategically and to see the forest from among the trees. Instead of embarking upon isolated initiatives with limited results, it’s important to think about your big-picture digital transformation agenda, to have a strategic vision for where you want to go, and to implement capabilities that can get you there, not only once but on a repeatable basis. 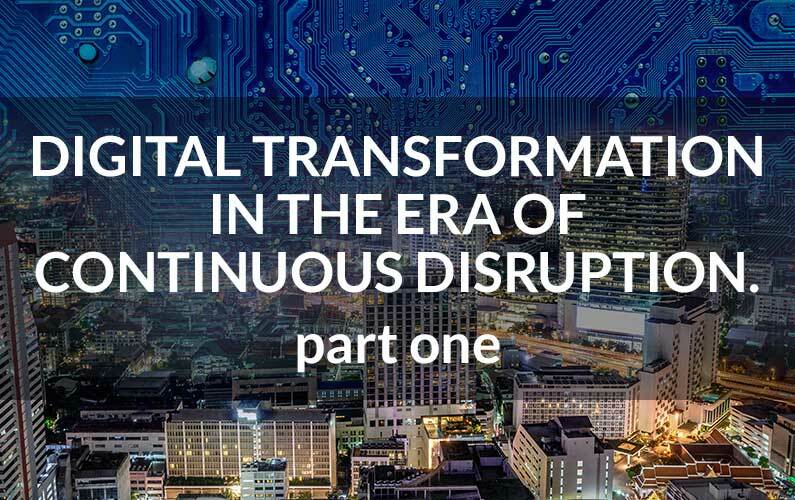 While emerging and disruptive technologies such as IoT and AI are important, it’s critical to step back and consider the broader, foundational capabilities that need to be established so that digital transformation can move from a one-time event for your organization to a continuous journey. These are key strategic themes within which you can incorporate the more specific technologies, tools and capabilities in your arsenal. For example, by combining digital experience essentials such as social mobile, analytics and cloud, with digital experience enhancers such as AI and IoT, you can create compelling new value propositions such as those we see from leading innovators such as Amazon. Case in point, the Amazon Go shopping experience is more than just AI, it’s a fusion of tech enablers – that include computer vision, sensor fusion, deep learning and a mobile app – all coming together to create a radically new in-store experience for shoppers. When these key strategic themes are combined with the perennial capabilities we mentioned earlier an organization has the necessary digital foundation and readiness – spanning people, process and technology – to be able to move forward with confidence. CLEARADVOCATE creates the right vision, strategy and plans to put your digital transformation project in the “win” column with strategy development, business cases, software and solution selections, assessments, roadmaps, organizational change management, governance and “path to value” plans. CLEARORCHESTRATE delivers predictable expertise and skill and the best project management to deliver the exact digital transformation outcome your business requires – from the back office to the edge, mobile worker. CLEARASSURE recognizes that digital transformation is never “one and done” by maximizing value realization and advantage by continuously enhancing, optimizing and supporting new business processes, technology and users. We ensure your digital transformation project delivers sustaining and predictable value and benefits through services such as partner management, post-project valuation assessment, continuous capabilities improvement, continuous solution enhancement, continuous process optimization, and managed services. With 52% of the Fortune 500 having been merged, acquired, gone bankrupt or fallen off the list since 2000, the downsides of digital disruption are clear. With only 5% of companies achieving or exceeding their expectations for digital transformation, the downsides of poorly-executed transformation are also clear. ClearPrism’s goal is a simple one: to help you thrive in the era of digital transformation. Our services eliminate digital transformation failure, protect business value and create new business, market and customer advantage—for every client, every project and every budget—without any surprises.